Agency: a permanent or semi-permanent organization within the government that is responsible for the oversight and administration of specific functions as well as enforcing laws enacted by the state legislature. Agencies are often empowered to promulgate rules and regulations to help enforce state laws. Assembly: the New York State Assembly is the lower house of the New York Legislature, the state legislature of the U.S. state of New York. The Assembly is composed of 150 members representing an equal amount of districts, with each district having an average population of 127,000. Assembly members serve two-year terms without term limits. To learn more, visit www.assembly.state.ny.us. Bill: a bill is a proposed new law introduced within a legislature that has not been ratified, adopted, or received assent. Once a bill has become law, it is thereafter an act. To learn more, visit www.assembly.state.ny.us or http://www.nysenate.gov/. 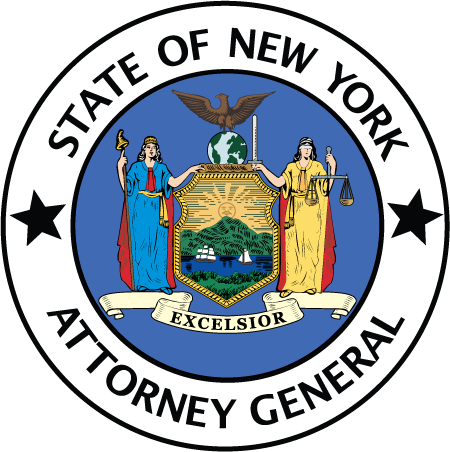 Attorney General: the New York State Attorney General is head of the Department of Law. In that role, the AG is the State's chief legal officer. The Attorney General represents the legal rights of the citizens of New York, its organizations and its natural resources. In addition, the AG is the chief legal advisor to the Executive branch of State government and defends actions and proceedings on behalf of the State. To learn more, visit www.ag.ny.gov. Bill number: each bill is assigned a number which corresponds to when it was introduced in that session. The bill number is used to identify a particular bill as it passes through the legislative process. To search for current New York State bills by bill number or by keyword, visit www.assembly.state.ny.us/leg/. Campaign Finance: In New York State, for most offices, candidates must either spend their own money to run, or get others to donate money to help pay for the race. Candidates, political parties and political action committees are required to publicly disclose from whom they raise campaign contributions and how they spent it. NYOpenGovernment currently provides campaign finance information from calendar year 2006 and onward. To learn more, visit http://www.elections.ny.gov/ and go to "campaign finance." Chapter: once bill has become law, it is assigned a "chapter number" among all of the laws enacted during that session. Charities Bureau: the Attorney General's Charities Bureau is responsible for supervising charitable organizations to ensure that the public and donors are protected from unscrupulous practices in the solicitation and management of charitable assets. To learn more about Charities Bureau, visit http://www.charitiesnys.com/. Client: a person or organization who spends more than $5,000 to retain, employ or designate a person or organization to carry on lobbying activities on the person's or organization's behalf. Comptroller: the New York State Comptroller is the state�s chief fiscal officer; charged with auditing government operations and is the sole trustee in operating the Statewide Retirement Systems (public employees� pension fund, worth over $150 billion). To learn more, visit www.osc.state.ny.us. Contracts: in the context of public contracts, these are the agreements used to procure the goods and services needed by the government from private vendors; the agreements may provide basic goods such as office supplies or complex projects such as highway construction. NYOpenGovernment is currently providing a list of public contracts approved by the New York State Comptroller during the period January 2006 through June 2008. To learn more, visit www.openbooknewyork.com, a service provided by the New York State Comptroller's Office. Elected Official: a member of the State Assembly, the State Senate, the Attorney General, the Comptroller, the Lieutenant Governor, or the Governor. FOIL: acronym for the "Freedom of Information Law" that allows members of the public to access public records and documents. To learn more, visit http://www.dos.state.ny.us/coog/. Floor: refers to the "floor" of the chamber for one of the houses of the legislature; a "floor vote" refers to a vote by the membership of the Senate or Assembly. General Election: a regularly scheduled election that determines which candidate will fill an elected office. Governor : the governor is the Chief Executive of New York State, responsible for preparing the state's executive budget, executing and enforcing state laws and acting as Commander-in-Chief of New York's military and naval forces. To learn more, visit https://www.governor.ny.gov/. Issue Area: subject matter or topic of interest; possibly the subject of a bill and/or lobbying effort, such as agriculture or education. Legislator: a person elected to make laws; in the New York State legislature, an Assemblymember or Senator. To learn more, visit www.assembly.state.ny.us or http://www.nysenate.gov/. Legislation: a matter of business for or under consideration by a legislative body (the Assembly or Senate); bills and resolutions are types of legislation. Legislative Committee: a body within the Assembly or Senate, comprised of several members, which specializes in a certain subject area (such as Labor or Environmental Conservation); a bill is usually referred to the appropriate committee shortly after it is introduced, and must pass through the committee before it may reach the full membership of its house. Committee members and chairpersons are appointed by the Speaker in the Assembly and the Majority Leader in the Senate, usually based on seniority and knowledge of the subject matter. Legislature: a body of people elected to pass laws; in New York State, the legislature is comprised of the Senate and the Assembly. Lieutenant Governor: the Lieutenant Governor is second-highest ranking official in New York State, elected on a joint ticket with the governor for a four year term; serves as President of the State Senate and acting governor in the governor�s absence, and fulfills other constitutional and statutorily defined duties. Lobbying: lobbying is defined as influencing or attempting to influence specific legislation, government contracting decisions or other executive actions. Lobbying is often directed toward elected officials; may include supporting or opposing a legislative bill, a public contract, a ratemaking process, or a rule or regulation. To learn more, visit http://www.jcope.ny.gov. Lobbying Laws: the laws that oversee and regulate activities aimed at influencing public decision making; typically lobbying laws require the disclosure of lobbying activities of a certain magnitude and regulate the types of gifts which may be given to elected officials by lobbyists. Lobbyist: a person who is paid more than $5,000 and is engaged in activities aimed at influencing public decision making. Member item: a portion of state funding allocated by Senate and Assembly. Allocations are not made according to any particular formula or public decision making process. The funds are typically used for community projects in the recipient members� districts. Political Party: a group of people with similar viewpoints and objectives, which seeks to influence policy by running candidates for public office, who share those viewpoints and objectives. Primary Election: the election in which members of the same party compete to determine who will represent the party on the ballot for the general election. Senate: the New York State Senate is the upper house of the New York State Legislature, and has 62 members who serve terms of two years, with each district having an average population of 300,000. To learn more, visit http://www.nysenate.gov/. Senate Majority Leader: the leader of the New York State Senate (just after the lieutenant governor, who acts as presiding officer of the Senate). The actual title of this position is "Temporary President and Majority Leader," and he or she is elected by members of the majority party in the Senate. Speaker: the leader of the New York State Assembly, elected by members of the majority party in the Assembly; also referred to as the Assembly Speaker. Sponsor: a bill�s sponsor is the member of the Senate or Assembly who is responsible for the bill�s introduction. Third Party Beneficiary: A third party beneficiary is the name of the individual or organization on whose behalf the Client has retained, employed or designated a Lobbyist to lobby. While in most instances a Client retains, employs or designates a Lobbyist to lobby for itself, there are situations when a Client will engage the services of the Lobbyist on behalf of an entity other than the Client itself. In these situations, the name of the third party must be disclosed.